We had briefly introduced Scalable Vector Graphics (SVG) in our web standards chapter. In this chapter, we will learn about creating SVG elements using D3. SVG provides different shapes like lines, rectangles, circles, ellipses etc. Hence, designing visualizations with SVG gives you more flexibility and power in what you can achieve. SVG is an image that is text-based. The following example demonstrates a rectangle in SVG. 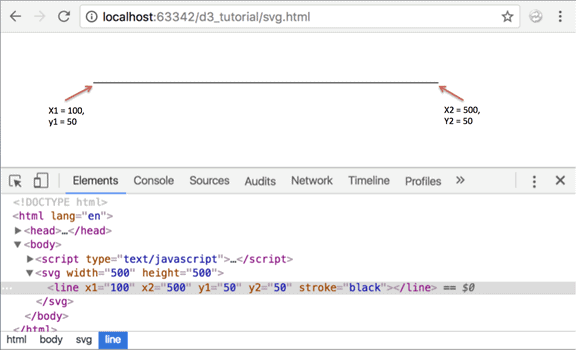 We have an <svg> tag here. 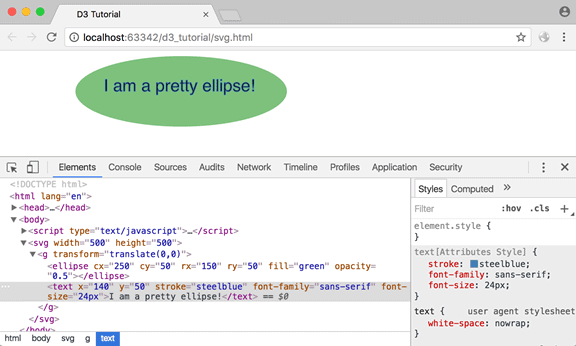 Think of SVG as a canvas to paint on (and don't confuse it with HTML <canvas> - that's a different element!). You need to specify a width and height for your canvas. And all your SVG elements like <rect>, <line>, <circle>, <text> would go inside this <svg> tag. Each SVG element has it's own properties - which includes both geometry and style properties. All properties can be set as attributes but generally, we provide geometry properties as attributes and styling properties as styles. And since SVG sits in the DOM, we can use attr() and append() just like we did for HTML elements. Let's learn about some of the most used SVG elements in visualizations and how to create and apply styling to them using D3 library. An SVG line element is represented by <line> tag. Consider the following example of line. We learned about manipulating DOM elements using D3 in the previous section. Using the same manipulation methods, we can draw the svg line with D3 as shown below. Let's understand the above code. 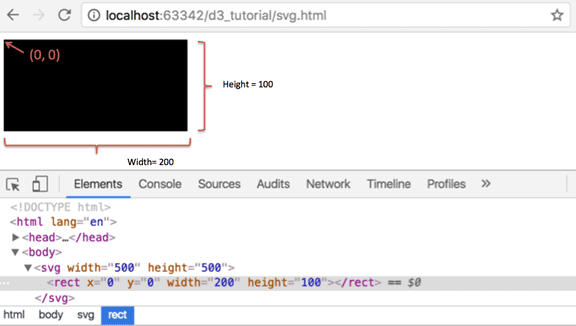 We create variables for the SVG's width and height. It is good to have them in variables so that you can change them at one place without having to go through the entire code in case you decide to change your SVG's dimensions. Next, we select the body element and append our SVG element to it and set SVG's width and height. We store the reference of this SVG in a variable called svg, so that we can use it later. Then we append a line element to our SVG and provide it with the x1, y1 x2, y2 and stroke attributes using attr() function. In the example above, we get a straight line without a gradient since we specified the same y-coordinates for both the start and end points. Using the same line, but using different y-coordinates, we can get a line with a gradient. A rectangle is represented by <rect>. Let's create SVg rectangle with D3 library. The output of the above rectangle example is shown below. In the above example, after adding the SVG, we appended a rect element svg.append("rect") and specified its x and y coordinates with respect to the origin and also specified the width and height of the rectangle. The default color is black, hence you see a black rectangle drawn on the SVG. A circle is represented by <circle> tag. 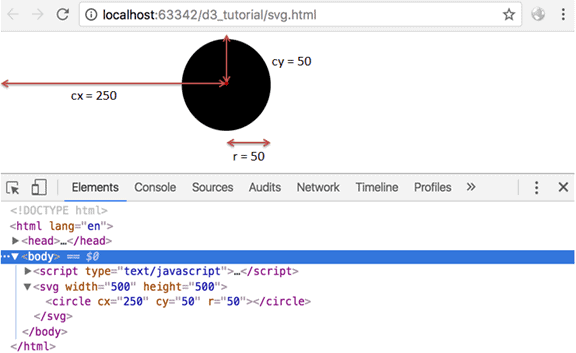 Let's create SVG circle with D3 library. The output of the above circle example is shown below. So what we did here was, after adding the SVG, we appended a circle element and specified its attributes; coordinates for the center of the circle (cx & cy) and the radius of the circle (r). Similar to the <circle> element, we have an SVG element for creating an ellipse. This is represented by <ellipse> tag. But, observe the two radii: rx and ry. The ellipse takes two radii. Let's create ellipse in D3. The output of the above ellipse example is shown below. 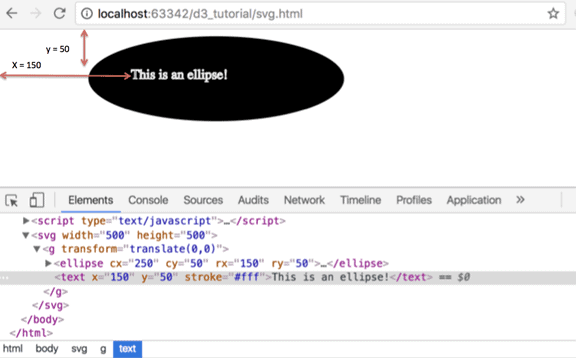 Look at the element we are appending to our SVG, svg.append("ellipse"). Unlike the circle, we have given it two radii, rx and ry. As we saw in the earlier chapter, SVG has an element to include <text> on the screen. Let's create text on ellipse using D3 as below. We have taken the same ellipse example above and added text to the ellipse. You might notice that we have introduced a new <g> group element here. The <g> element is used when you would like to group certain SVG elements together. In our case, we are using <g> to hold our <ellipse> and <text> elements together. The group element comes in handy for applying transformations so that the transformations are applied to all the child elements of a group. We have added a stroke attribute to our text so that our text is visible in white over our black ellipse as shown below. You may have noticed that we did not specify any color in the above examples. Yet our elements were painted with black color. This is because the default SVG color is black fill with no stroke. Fill This is the fill color for your element. It can be color name, hex value, or RGB or RGBA values. stroke This is the stroke color. Like our line example above, we can specify a color for our element. stroke-width Stroke width specifies the width of our line or boundary. This is in pixels. opacity Opacity will specify an opacity/transparency number. 0 is completely transparent and 1 is completely opaque. font-family For text elements, we can specify the font-family. This works like CSS. font-size We can also specify the font-size for text elements. All of the above properties can be applied directly or by using CSS. 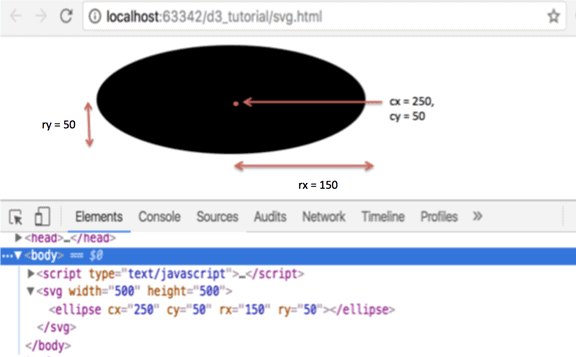 Let's rewrite our ellipse example and add some more style properties to the ellipse and text elements. The output of the above example is shown below. Thus, we can create SVG elements using D3.js. 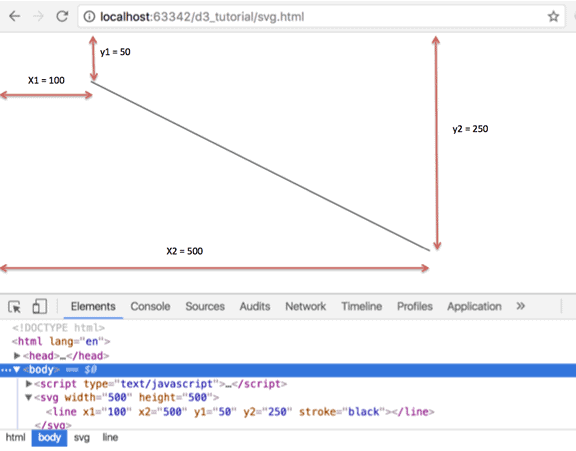 Let's create SVG chart using D3 in the next chapter.